Abstract: The criteria established by the DSM-IV-TR are one of the most widely accepted procedures to diagnose the TDAH. There are three different subtypes: inattentive, hyperactive-impulsive and combined. Nir-HEG enables the assessment and intervention of the disorder by measuring blood flow blood oxygenation, recorded in areas specifically selected. In this research, the instrument nir-HEG was applied to 100 subjects classified into four groups: ADHD-inattentive, hyperactive, combined subtype and control group. Simultaneously with the evaluation of blood flow, subject is evaluated with a continuous performance test (TOVA) whose duration is approximately 20 minutes. Therefore, the reason of this research is to assess the instrument over a long period of time while performing a continuous performing task (CPT). The results show statistically significant differences between the control group and the other with ADHD and among the subtypes in the variables of executive control and short evaluation with the nir-HEG. As for the long evaluation of blood oxygenation during a performance of an executive task, some differences can be seen among the subtypes with ADHD, although not statistically significant. We conclude that this measure -ratio HEG-is sufficiently stable during the 20 minutes assessed, so that in a few seconds we may be getting a valid measure. Keywords: blood activity; nir-HEG; cortical activation; executive control; Q-EEG. Abstract: Delay discounting (DD) is a measure of impulsivity that describes the rate at which rewards lose value as the delay to their receipt increases. Greater discounting has been associated with various types of drug dependence in recent research. The present study compared the performance of two groups of individuals on a delay discounting task: cocaine dependents (n = 15) and control non dependents (n = 15). A prototypical DD choice task were applied where participants were asked if they would prefer a smaller sum of hypothetical money available immediately or a larger sum of hypothetical money available at some point in the future. Analysis revealed that cocaine-dependent individuals discounted delayed rewards more than not dependent individuals. Delayed reinforces lose their value significantly faster in the group of cocaine dependents compared with non-dependent controls. The DD paradigm may be relevant in research on cocaine dependence and it is a useful starting point for the evaluation and development of effective treatments in this area of intervention. Keywords: delay discounting; reinforcement; impulsivity; cocaine; addiction. Abstract: The aims of this study were to determine the factor structure of the scale of Perceived and Feared Discrimination for women with HIV (DTP-48-MV), to calculate its internal consistency, to describe its distribution and to verify its convergent validity. The PFD-48-WH scale and the STAXI-2 anger expression scale were applied to a random sample of 200 women with HIV, with 34.88 years of age mean and 3.79 years of the diagnosis time mean. Six correlated factors, that explained 73% of the selected 40 items total variance, were found: Feared discrimination, perceived discrimination in workplace and neighbourhood, perceived discrimination within family, perceived discrimination in clinical care, perceived discrimination before the consultation of the medical record, and perceived moments of discrimination. The fit to data was good by scale-free least squares: GFI = .94, AGFI = .93, NFI = .92 and RFI = .91. The values of internal consistency of total score and factors were high. The correlation between the total scores of both scales was positive and significant. It is concluded that the scale is reliable and valid, so it will allow planning research designs in which feared and perceived discrimination can be measured. Keywords: discrimination; anger; women; HIV/AIDS; psychometrics. ¿Cómo se relaciona la ansiedad escolar con el rendimiento académico? Abstract: Little is known about the relationship between school anxiety and academic achievement of students. This study analyzed the relationship between school anxiety and academic achievement in a sample of 520 Spanish students from 12 to 18 years (M = 15.38, SD = 1.95). 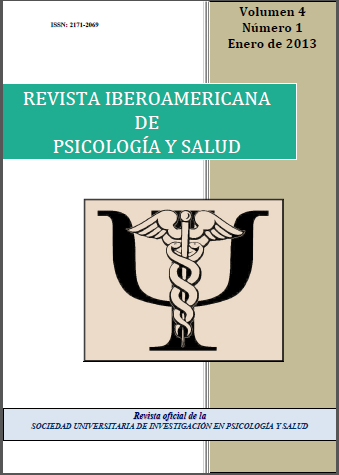 Results revealed that students with high performance in Spanish language (language and literature) had significantly higher scores in anxiety faced with school failure and punishment, anxiety faced with aggression, behavioral anxiety and psychophysiological anxiety. Similarly, students with high performance in mathematics had significantly higher scores in anxiety faced with school failure and punishment, anxiety faced with aggression and behavioral anxiety. Furthermore, students with academic success scored significantly higher in anxiety faced with school failure and punishment, behavioral anxiety and psychophysiological anxiety. However, students with school failure had significantly higher scores on anxiety faced with social evaluation. Finally, anxiety faced with school failure and punishment was a significant predictor of high achievement in Spanish language (language and literature) and mathematics, whereas anxiety faced with school failure and punishment and anxiety faced with social evaluation were significant predictors of overall academic success. Thus, the results indicate a higher academic performance of students who have certain fears school. These results could be used by teachers, school psychologists and clinical psychologists as an empirical basis to develop preventive and effective intervention of underachievement. Keywords: adolescence; school phobia; school anxiety; school fears; academic achievement. Abstract: Collaborative recall can be a potential source of false memory. This study examines whether the presentation of misinformation during a collaborative recall test produces more false memory than when such information is notified in writing. 40 participants, aged from 21-34 years (M = 25 years, SE = 0.69), watched six scenes of a household for 15 or 60 seconds each. In the social contagion condition the participant and the confederate saw and recalled together the objects of scenes. In the implied contagion condition the participant saw and recalled scenes alone while the responses belonging to another participant were provided. In both conditions objects of high and low expectative that did not appear in the scenes were introduced. Finally, all participants recalled objects from each of the scenes. Scenes infected caused a higher proportion of false memories than uninfected scenes in both types of contagion. There was also more false memory when objects were typical of the scenes and presented for 15 seconds. The results indicate that false memories can be formed using the wrong answers from others without requiring their physical presence, and that participants combine information from its own memory with the answers from the source of contagion due to effect of informational influence. Keywords: false memory; social contagion; misinformation effect; source monitoring.